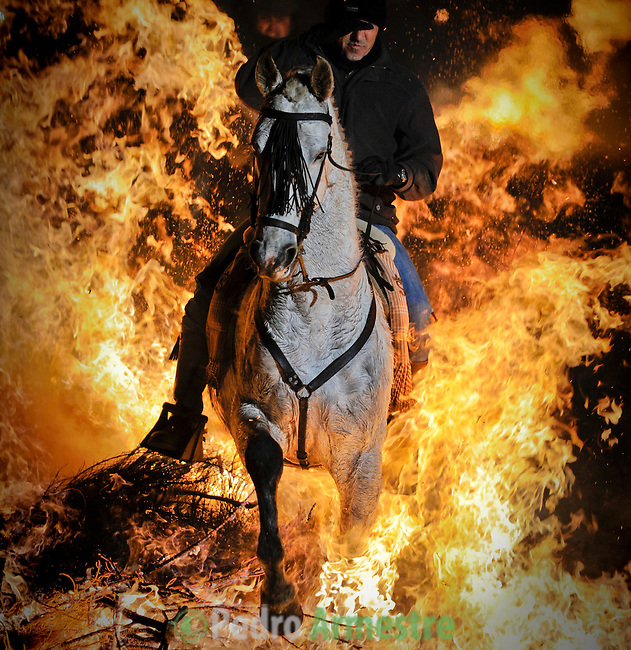 A horseman jumps over a bonfire in the central Spanish village of San Bartolome de Pinares to open the celebrations for the feast of Saint Anthony, patron saint of animals, on January 16, 2012..Todos las noches antes del Día de San Antón, se celebra la fiesta de las Luminarias. Unas veinte hogueras se encienden en las calles del pueblo y casi cien caballos saltan por encima para que el humo les purifique y ahuyente a los malos espíritus. Esta tradición cuenta con más de doscientos años, cuando una epidemia mató a todos los caballos del pueblo..Every night before the Day of St. Anthony, is the Feast of Lights. Some twenty bonfires are lit in the streets of the town and nearly a hundred horses to jump over the smoke to purify them and drive away evil spirits. This tradition has over two hundred years, when an epidemic killed all the horses in town. (c) Pedro ARMESTRE.